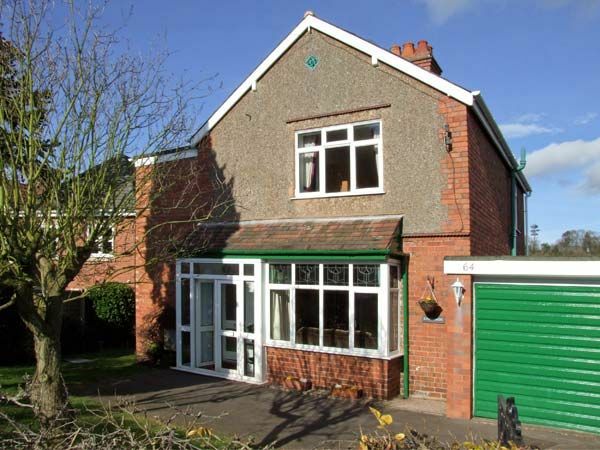 64 Station Road is a detached cottage in the Staffordshire village of Wombourne, a few miles from Stourbridge. The cottage has a double room, a twin and a single, a family bathroom and additional ground floor cloakroom. There is a well-equipped kitchen with pantry and utility room, a dining room and a sitting room with piano. Outside is off road parking, and a pleasant enclosed lawned garden surrounding the property. 64 Station Road is a family friendly cottage for enjoying the attractions of this area, including the West Midlands Safari Park, Cadbury World, Ironbridge Gorge, Bridgnorth and more. Amenities: Gas central heating with electric fire in sitting room and gas fire in dining room. Electric oven and hob, microwave, fridge, freezer, washing machine, dishwasher, TV, DVD, CD, radio, iPod dock, selection of books, games and DVDs. WiFi. Fuel and power inc. in rent. Bed linen and towels inc. in rent. Cot and highchair available on request. Off road parking for 2 cars. Additional roadside parking available close by. Lockable bike storage. Enclosed garden with lawn and patio with furniture. Sorry, no pets and no smoking. Shop and pub 4 mins walk. Town: Wombourne is a Staffordshire village near Stourbridge and Bridgnorth, with a village green and good selection of shops and pubs. Wombourne is close to nature reserves and walks along the Staffordshire and Worcestershire canal, as well as the West Midlands Safari Park, Severn Railway and Ironbridge Gorge. Three bedrooms: 1 x double, 1 x twin, 1 x single. Bathroom with bath, shower over, basin and WC. Cloakroom with basin and WC. Fitted kitchen. Utility room. Dining room with living flame gas fire. Sitting room with flame-effect electric fire and piano. Gas central heating with electric fire in sitting room and gas fire in dining room. Electric oven and hob, microwave, fridge, freezer, washing machine, dishwasher, TV, DVD, CD, radio, iPod dock, selection of books, games and DVDs. WiFi. Fuel and power inc. in rent. Bed linen and towels inc. in rent. Cot and highchair available on request. Off road parking for 2 cars. Additional roadside parking available close by. Lockable bike storage. Enclosed garden with lawn and patio with furniture. Sorry, no pets and no smoking. Shop and pub 4 mins walk. We were very happy with our recent stay at Loningstar. The house was just as clean and well kept as the photographs promised. It was exceptionally well stocked with everything one could possibly need for a multi week visit and the owners are lovely people. They gave us a warm welcome upon arrival and were very helpful during our stay. I would not hesitate to recommend this property or to book it again for future stays. It really lives up to its promise. Thank you for a very enjoyable visit! We have had a lovely stay in this beautifully well kept and immaculately clean house . The house is very well built so there are no disturbances from other occupants or hot water or heating pipes etc. It is very well appointed with everything you need and a lot of thoughtful extras on top. Ruth was the perfect hostess who also provided a very special tea and cake on arrival. I have not given 5 stars due to a road running along side the property which at certain times of the day was busy but it did not disturb us too much. Wombourne is a lovely village with great walks and cycling and many other places of interest near by.